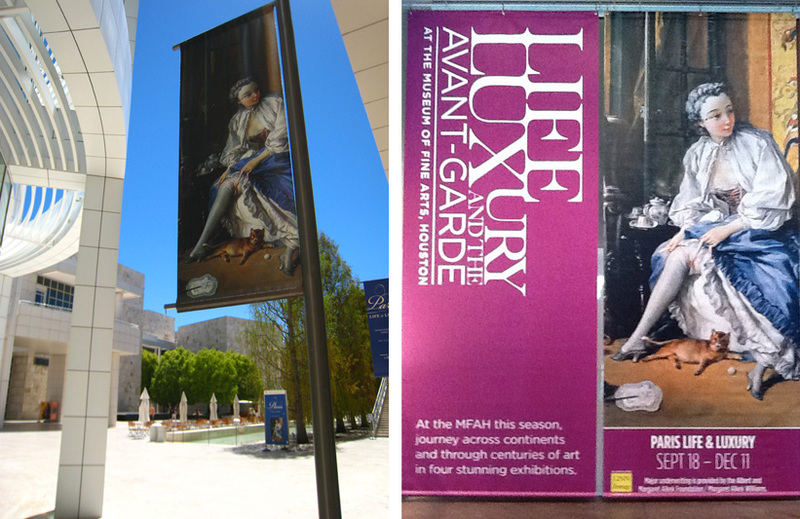 We flew to Houston, Texas to see the exhibition, "Paris: Life & Luxury" in it's second venue. As you know from a previous Missive, Stiebel, Ltd. is a lender to the show. Many of you have seen an exhibition in more than one venue and realize that they are really never the same show. I learned this some 25 years ago when we saw an exhibition on the art of the Second Empire in France. Since in those days many still looked down their noses at "old art" created after 1800, it was thought to all be reproductions of the golden age of France in the 18th century. The exhibition in the Philadelphia Art Museum was a real eye-opener which completely changed my way of thinking and I started to really enjoy the art of that period. Later in the year we were in Paris and were delighted to learn that the same exhibition was on in the Grand Palais. It should have looked sensational there, was I disappointed! Thank goodness we saw the Philadelphia version first; If we had seen "The Second Empire" show in Paris first we would never have gone to the second venue. It is too long ago for me to remember the differences in detail, but I know that in Philadelphia many of the objects were in their own vitrines or juxtaposed to appropriate objects and all was beautifully lit. In Paris the objects were just lined up in dim light. 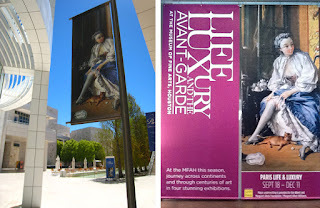 Move ahead thirty years and we saw the "Paris: Life & Luxury" show installed differently with some of the objects switched out because some lenders would only agree to a single venue or the Houston curator in charge of the show, Helga Aurisch, had different view of the same material. The concept of the exhibition is based on four small paintings by Nicholas Lancret representing the four times of day and was certainly open to interpretation. The co-author of the exhibition at the Getty, Charissa Bremer-David, came to Houston for the opening. She said that the show was like a deck of cards that could be shuffled and dealt in many different ways. This is, of course, true of any exhibition. One of the big differences in the Houston show was dictated by the size of the galleries. The Getty version seemed more intense and intimate. It seemed to give more of the atmosphere of the period. On the other hand, the Houston exhibition was a more traditional museum presentation with the focus on the individual objects. One of the physical changes in the objects was a bed in the first gallery. 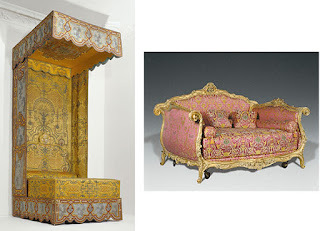 The Getty showed an extremely rare Louis XIV bed with a period embroidered cover, hangings and canopy, that was too delicate to travel to a second venue. 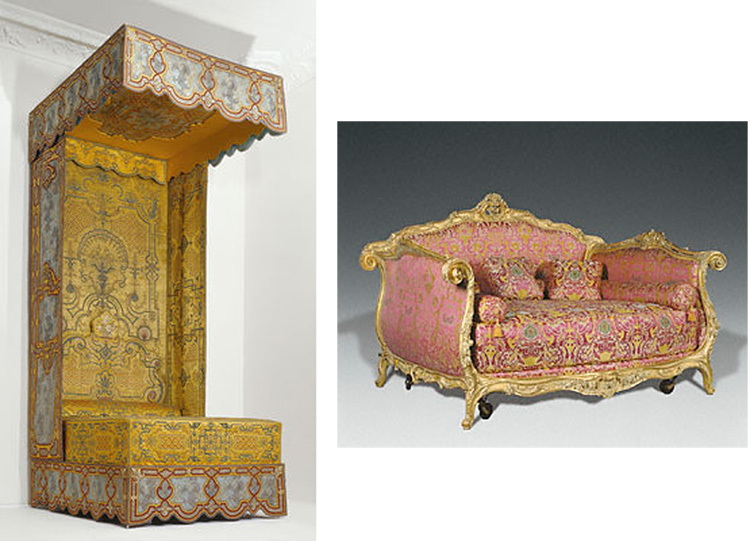 It was replaced in Houston with a Louis XV Lit a la Turque (a three sided bed, 8 feet across) that is richly carved and gilded. This made for a less esoteric and more opulent opening to the exhibition. There seemed to be relatively more light in the Houston version. Then, ironically, during the opening half the light tracks went out and we could see the show more the way it would have been seen by candlelight in the eighteenth century. When they came back up again we could see the objects far clearer in their museum setting. When the lights went off we were standing next to 4 paintings in dark wooden frames. The pictures went dead. We happened to glance behind us and saw a painting in a gilded frame still glowing. It reminded us why there was so much gilding in French 18th century interiors: it reflected the candle light giving off more illumination. And the richer you were the more you had gilded. If you see a movie more than once you may get more out of it, but that is only because you missed something the first time. In the second venue of an exhibition you will have a whole new experience.